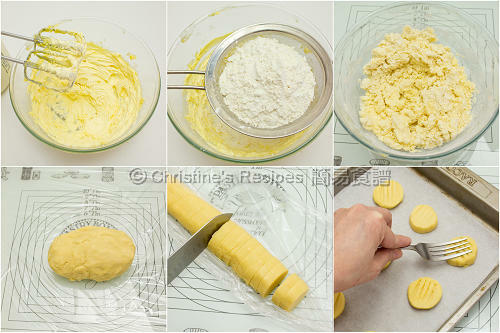 These butter cookies are best for party or as presents. Each bit of the buttery cookies will literally melt in your mouth. Do share these butter cookies with your family or friends. Yes, they are like melting moments. Each bit of the buttery cookies will literally melt in your mouth. It’s hard to stop eating after the first bite. I only make these cookies to bring along for our large social gatherings. Sharing is loving. Each person can only have one or two pieces. Not surprisingly, the whole tray was gone within minutes though. Combine the plain flour, corn flour, custard powder and baking powder and sift through a sieve. Set aside. In a large mixing bowl, use an electric mixer to beat the butter and icing sugar until fluffy and pale. Mix in the vanilla extract. Sift in the flour mixture. Beat at low speed with an electric mixer. Remember to scrape down the sides of the bowl with a spatula. Lightly knead into a dough. Wrap with a plastic film and roll into a tube in 3½cm thickness. Wrap it up and refrigerate for about 15 to 20 minutes, or until it’s workable. Preheat oven to 180C / 356F. Line two baking trays with baking paper. Remove the dough from refrigerator. Slice into 1½cm-thick portions. Place each portion in single layer on the lined trays, each at least 3cm apart. Use a lightly greased fork to gently press the small dough. Bake in preheated oven, for about 15 minutes, or until lightly brown. Remove from oven and let them sit for 5 minutes. Transfer to a wire rack until completely cool down. If you don’t have two baking trays or your oven is not big enough, you can bake in two batches. Keep the rest of the dough in refrigerator. If the weather is too warm, you find the dough is too greasy. Don’t worry. Just chill the dough for awhile until workable. I love simple cookies with a rustic look. You might like to use a cookies cutter or any moulds to make some delicate patterns on your cookies. I love butter cookies, I m drooling over here. can i omit the custard powder? Yes, you can omit it. But the colour of cookies would be pale and not yellow. Can I replace custard powder with greentea powder? Is a good and simple recipe. Bookmarked ! Thanks! What is custard powder? And do you have measurements in cups, etc? FYI, here's an article about custard powder. Although I didn't use the same brand, you can have an idea of what custard powder is. It might be more crumbly though. What can I replace custard powder with? I live in the US. Your cookies look so yummt! Thanks, Christine. You can simply skip the custard powder, or replace with egg yolks. how many egg yolks should i use to replace custard powder in this recipe? I live in Los Angeles and I can buy custard powder from Bristol Farms market. It is also available from Chinese markets. Thanks for the info, Wendy. Very helpful. Thank you for this recipe.Love to read your blog so much. can I know what butter is recommeded? non salty or salted butter? thanks ! Got one here. Not sure if it's the one you're after. Can I use full cream milk powder instead of custard powder? You might if you like. The colour of cookies will be lighter though. This was really simple and easy to make yet was very delectable. I made a few for my sweet little nieces and now they made me promise to bring some more next time. Great recipe. So glad that you little nieces liked these cookies. The flavor of these cookies is exceptional. I love these cookies! I was out of crunchy so I used creamy. . . The flavor of these cookies is exceptional. Absolutely delicious. This is really fun to prepare. It took me and my Daughter a couple of tries before perfecting the cookies but it's worth it! my Daughter really enjoyed shaping the dough and decorating it with a fork. Hi Christine, tks for the recipe! They turned out so yummy! But want to check why my dough was so sticky? Is it not enough flour? If the weather is too warm or knead too long, the oil will release. Simply chill the dough in fridge until workable again. Hi, Christine, I hv try ur recipe, it's turn out well.. But may I knw why the frangrace of butter is not that strong tht we used to buy frm outside market. Try to use quality butter. Its fragrance is better. 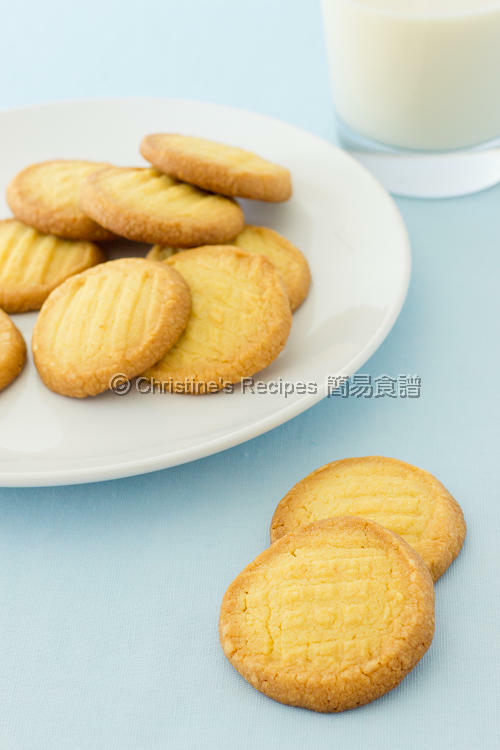 Some store-brought butter cookies might add some fragrant essence in order to produce an intense smell. How long it can be keep ? Since cny is coming,wondering if I can keep the cookies until cny? Keep in air-tight container or plastic bag. They could be kept for a week or so. can you tell me if u have the recipe for chocolate cookies? Yes, I have a few. You might use the search box on top to search " chocolate cookies". Yes, you can grease the tray instead of using baking paper. But watch out the bottom of cookies will still stick to the tray and don't get them burnt anyway. I just get the cheaper brand from the nearby supermarket, Coles. It's unsalted. How did your dough look like before baking? Was it too soft? If the dough becomes too soft, put it back into your fridge until it turns a bit colder and harder. The cookies would be better. the problem is i can only get accurate measure with a cup.. and will the taster work? When it comes to baking, try to use gram rather than cup measurement, because it's more accurate and ensure the best results. No, it's not a must. But you'll get better results for having crunch cookies. When kneading the dough, move fast, try not let the butter melt in the dough. Supposing the butter melts in the dough, what is the solution? If the butter starts to melt and you feel the dough turns a bit greasy, just put it back in the fridge. Chill it until it workable again. If I replace the custard powder with cocoa powder, will the texture still be melt-in-your-mouth? Sure, you can use instant coffee instead. The texture won't change much as the amount is quite small. Hello Christine. A search for a steamed bun recipe brought me to your blog and I have been stuck here for the past hour or so reading and saving numerous recipes that I would be trying out in the very near future. Egg tarts, butter cookies, pineapple roll tarts and banana chiffon cake are already lined up for the next few week-ends. I surely love that your recipes are already in weight because I have been baking using weight for the past couple of years and actually find it difficult and impractical to measure by volume. I am so happy to find your great site and have a lot of catching up to do because I want to try so many of your recipes! Hope you'll like the recipes as much as I do. Hi Christine, I tried the recipe today.. It was awesome! Can you use vanilla essence instead of extract? Sure, you can. Vanilla extract is more natural though. i made this. it was awesome. everybody loved it. and my mom got the receipe from me and she will too make it. thanks a lot. keep cooking. Thanks for your love of my recipe ! can i add almond flakes? Yes, you can. Almond flakes are fantastic. These were lovely! They weren't coming together very well so I added an egg and it turned out beautifully! I have baked 2 plates full for the election cake stall at our school tomorrow. I put hundreds and thousands on top and called them fairy bikkies. Thanks for the recipe! Or should I use superfine flour to substitute the plain flour? You can if you like. The texture might be slightly different though. Do we have to add eggs? This recipe yield for custard powder instead of eggs. So the cookies are very crunchy as well. This recipe is a must-keep! Simply met-in-the-mouth on first bite! Thanks for sharing such great recipe! Keep it coming! Hi, if I would like to bake some chocolate butter cookies, can I just add unsweetened cocoa to this recipe? If yes, how much cocoa powder would you recommend? Thanks for the recipe :D This recipe is really awesome!! Melt-in-mouth is the word!!! The dough should be fine if you chill it in freezer. Just rest it for a while at room temperature before popping them in oven. may I know why after I chilled the dough and cut it into pieces, it is always cracking? is this because chill for too long? I tried to leave at room temperature for a while and cut it, it became greasy. my cookies become no good shape. There's no other trick. Just keep the dough neither too soft nor too hard, cut them while it's workable. 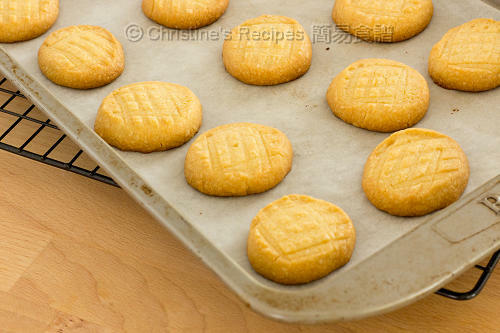 Well i was googling for some easy butter cookies and i found this thread and yes i am not disappointed at all, i tried and i am still standing next to the oven and let me say that the smell is awesome.. the method itself is even easier than the cookie mix.. Thanks thanks thanks and thanks for this awesome perfectly easy recipe.. So glad that you loved this recipe. It's my family's favourite too. Hi Christine, thank you for sharing this awesome recipe. Is easy and not time consuming and it just melt in your mouth. Wonderful ! Glad that you liked it. Hey Christine. I enjoy baking and always want to impress and your recipes got my mother-in-law and fellow biker friends asking for more and the recipe. The texture will be changed if you skip the baking powder. Please hop over to my Chinese food blog via the link on top, then key in "butter cookies", you'll get it. Hi Christine, can I chill first then I make the dough shape later? Yes, you can made the dough ahead and chill in fridge. Hi! Christine, since i don't have custard powder can i replace it with cornflour? And i like to know is it I can only bake 1 tray at a time? Cause my oven got 3 tier. You can't replace the custard powder with cornflour. No worries. When you bake the first tray of cookies, you can keep the rest of the dough in fridge. When the first batch is almost done, you can remove the dough from the fridge and get them ready to pop in the oven. I don't have an electric mixer. Can I mix it manually? You might try to use a balloon whisk and need more elbow grease. Is there an alternative for corn flour or starch please? Might try other low protein flour that comes in handy. It'll make the texture more favourable. Hi Christine! I really like to try this recipe but I couldn't find custard powder here in my place, what can I substitute instead? Does egg yolk works in place of custard powder in this recipe? And how many yolk should I used? Please, I wanna here your answer! Thanks! What makes these cookies especially crunchy and unique is the custard powder. If you can't find any, you might replace with an egg yolk. Tried your recipe and the texture is awesome! Is it ok if I pipe the soft dough into a piping bag to pipe the cookies then put it in the fridge after before baking it? I'm afraid that the dough texture might be too thick and it's quite difficult to pipe it out. If you have any cookie cutters, it'll work. Sure, you can chill it in fridge until you bake it. Is it possible to convert the recipe to cups/ml? Thank you so much! When it comes to baking, especially for baking these delicate cookies, it's best to use weight measurement to get the best results. I think it's also what you want. The reasons are here. how about making cheese cookies? Hi Christine, I tried exactly your method yet my cookies were too crumbly that it is so easy to break. Is there a way of making it not easily breakable? These cookies are really crunchy. You might add a little bit of whisked egg if you want them firmer. Just made these and they turned out awesome. I have been on the hunt for the right butter cookies. This will be my new go to recipe! Super easy to make! I found the custard powder at World market. Glad that you tried this recipe and liked it. Your info of where to get custard powder is much appreciated.